“Brownbacking” is dying. That’s great news. Urban dictionary has the best definition for “brownbacking,” but we’re not talking about that today. We’re talking about the Republican policy practice of cutting just about every public service to the bone, how that’s on its way out, and how that means the GOP’s long-dominant Business Wing, one of its three major pillars, is steadily ending its 40+ year winning streak. Named after Kansas Senator Sam Brownback, brownbacking has a turgid history replete with rich men scheming to be richer by lowering taxes for one another. This echelon of plutocrats — the GOP Business Wing — had long lambasted “Leviathan,” which was both the Biblical sea monster that swallowed Jonah and the title of Thomas Hobbes’ 18th century treatise that argued humanity was an ugly mess and needed a strong central government to survive. For conservatives going back to the 1950s, Leviathan was a Bad Thing— and there was no way to kill it, only shrink it. Popular amongst conservatives was the “starve the beast” theory— that is, instead of actually passing legislation to cut programs or shut down entitlements, conservatives were to gut budgets as much as humanely possible to drive people out of government service and thereby reduce its overall footprint. That became a particularly popular tactic after it became clear that presidents could not just shut down, say, the EPA, even though the Business Wing despised its regulations. As the GOP is made up of a large Culture Wing, a smaller Business Wing, and a still smallest Libertarian Wing, cutting actual programs was a hard sell — entitlements and regulations tended to benefit the Culture Wing, who often were poor, rural, and exposed to vicissitudes of the Business Wing’s corporations. This dynamic most recently played out in the battle over Obamacare, which the Business Wing hates in its bones. But fear of backlash from the Culture Wing actually stymied its death, and forced the GOP to “starve the beast” — specifically by removing the individual mandate. 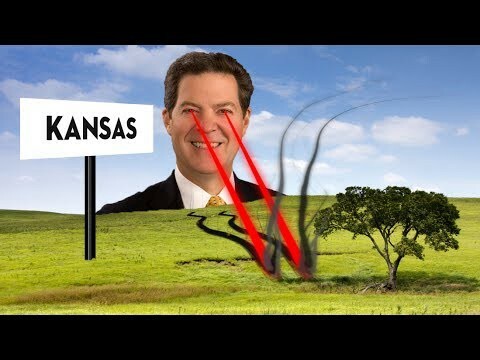 Nowhere did the “starve the beast” tactic go furthest than in Kansas, where Governor Brownback basically used the cover of the Great Recession, which forced all states to cut budgets, and the Culture Wing’s (mostly racially-motivated) anathema to President Obama to gain a commanding hold of Topeka. He then decided he’d show all us liberals how starving the beast would bring Kansas bouncing to 1st in economic growth. A lot of other red places did versions of this too. Arizona, West Virginia, anywhere that had a strong Culture Wing that empowered the GOP during the Obama years fumbled towards the Brownback model. It backfired spectacularly. Kansas didn’t get double digit economic growth, partially because Kansas is Kansas and how many big corporations are going to want to move there, regardless of tax rate? Turns out, cutting taxes and public services were irrelevant to job growth. That noble experiment has done the job of discrediting the Business Wing as well as Stalin’s purges did Communism in the 1930s. As a consequence, voters and people are demanding more public services, not less — and as teachers go on strike to force Business Wing GOP leaders, like those in Oklahoma, Arizona, and West Virginia, we’re starting to see the shape of things to come. That’s because the Cultural Wing of the GOP is steadily breaking up with the Business Wing. Remember, these two weren’t on great terms as was, and their relationship has worsened under Trump. The Business Wing wants more trade, more cheap immigration, and tax cuts that pare back government and allow them to pocket the cash for themselves. The Cultural Wing despises free trade, immigration, and largely has had limited experience as to the true effects of tax cuts — after all, the last major ones were in 2001 under George W. Bush, and before that under Reagan in 1981. Both of those tax cuts accompanied some economic booms, though they weren’t really responsible for actual growth. They also didn’t really touch public services that the Cultural Wing so often wanted and used. But after the Great Recession, tax cuts and budget slashing that pleased markets and the Business Wing actually had the chance to affect peoples’ lives within the Cultural Wing. That’s suddenly made Brownbacking toxic: the Trump tax cuts, for example, are historically unpopular. How many GOP candidates will run on the tax cuts in November? And how many will lose? That’ll be a revealing number to see, but the odds are quite good a lot of GOP strategists will advise the next round of candidates in 2020 to avoid talking about the tax cuts that have given very little to the Cultural Wing in terms of real pay. If they don’t, they may see a blue wave in 2020 that makes 2008 look like child’s play. This is all leading up to an inevitable split between the tenuous alliance of Cultural and Business Wings, who have long wanted very different outcomes from the GOP. How that split plays out will be very interesting to see — I’ve written about the possible scenarios here — but that the split is coming, as the stresses of the Trump era witness the powerful Business Wing’s priorities clash with the ascendant Cultural Wing. Could the Business Wing seek shelter in a corporate Democratic Party? Possibly, but that too poses challenges. Regardless, the Business Wing’s 40+ years of ascendency, brought in by the Reagan Revolution, seem about to end.